“Don’t cry because it’s over, smile because it happened” (Dr Seuss) are the words that irritatingly run through my busy mind whenever my mobile phone decides to up and die on me in the middle of the day whilst I am still out and about. So with Valentines Day looming, it was through whispers that I decided to check out the Power Wallet and find out whether it can be considered the ultimate gift for a FashTech diva. Created with beautiful faux leather (textured PU leather material), this animal friendly wallet will comfortably house your cash, credit cards, emergency fresh mints next to your iPhone (including iPhone 6 plus) or Android phone. What makes the handsome Power Wallet stand out is the hidden away lightweight high-capacity backup battery that can be used to charge your phone. The roomy Power Wallet is also big enough to fit some cell lenses and a pocket light if you wish. 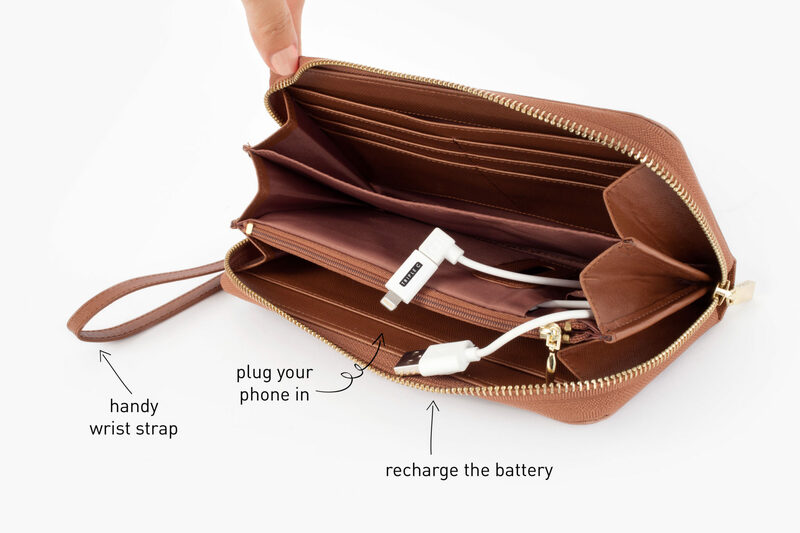 The only catch is that you have to keep the wallet battery charged for it to be useful when you are in need. So boys, if your fashion conscious girl is always forgetting to charge her phone, treat her to this stylish wallet available in two colours at a friendly price of $79.00 (BUY NOW) and believe us when we say, she will thank you. Carry everything in one wallet!